24 August 2018: When did humans first leave Africa? This blog post is titled ‘When did humans first leave Africa?’ I confess, it’s a trick question, but we’ll come back to that later. So to start with, let’s attempt to answer not a trick question but a trickier question: when did Homo sapiens first reach Australia? This has been a contested debate for several decades, with proposed dates stretching from 75,000 years ago to 40,000 years ago. The bottom mark was established by the dating of the remains of Mungo Man, the oldest remains of anatomically modern humans (AMH) yet found outside Africa. Towards the upper end, luminescence dating of sediments around artefacts recently found at Madjedbebe in the Northern Territory give a date of around 65,000 years, although this is contested. In a recent article in The Conversation, ‘When did Aboriginal people first arrive in Australia?’, authors Alan Cooper, Alan N. Williams and Nigel Spooner state the ancestors of Aboriginal Australian first reached Australia sometime between 50,000 and 55,000 years ago, just after AMH left Africa. This date is now generally accepted by palaeoanthropologists. But that presents us with a quandary. As I wrote in an earlier blog, fossils from the cave of Jebel Irhoud in Morocco, together with genetic data from a 2,000 year old Khoe-San skeleton, suggests our species arose in Africa at least 300,000 years ago. So why did it take our species a quarter of a million years to find the exit? Well, as it turns out it, it didn’t. In a January 2018 report in Science, authors Chris Stringer and Julia Galway-Witham note that recent fossil evidence from Israel suggests our species had left Africa by 180,000 years ago. The report also recounts genetic analyses of Neanderthal fossils from two caves, Denisova in Russia and Hohlenstein-Stadel in Germany, that ‘indicate at least one earlier phase of introgression, from H. sapiens into Neandertals … estimated at 219,000 to 460,000 years ago’. At this stage, it seems that AMH could have left Africa over 200,000 years ago, and yet DNA evidence strongly suggests the ancestors of all non-African members of our species left Africa no earlier than 60,000 years ago. Nielsen et al. write that the latter date indicates when the ‘ultimately successful’ dispersal of H. sapiens from Africa occurred. In other words, those members of our species who left earlier are now extinct and left no trace in our genetic record. On the other hand, a letter published in Nature in 2016 suggests that earlier migrations of H. sapiens from Africa may have left their mark on some of us after all; specifically, Papuans. This brings us back to the article in The Conversation. Cooper et al. discuss how Aboriginal Australians moved to and occupied Australia around 50,000 years ago. Of course, 50,000 years ago it wasn’t Australia, it was Sahul, a single landmass comprising Australia, Tasmania and Papua New Guinea. Yet the letter in Nature suggests that Sahul might in fact have been occupied by H. sapiens before that date. Its authors hypothesise either that these people came from an unsampled archaic human population that split from modern humans ‘either before or at the same time as did … Neanderthal’, or that they were a modern human population that left Africa ‘after the split between modern humans and Neanderthals but before the main expansion of modern humans in Eurasia’. The data from all this research is sometimes confusing and contradictory. Over the last quarter century palaeoanthropology has undergone a great revolution driven partly by discoveries of new hominin fossils (eg H. floresiensis and H. naledi), and partly by new and refined techniques in analysing DNA. There is a lot of data to sort through, doublecheck and assess. Nevertheless, as measurements are refined and new discoveries are made, we learn more about our past and so more about ourselves. So, why is the header a trick question? All the above information deals with the history of just one species, our own. But H. sapiens were not the first humans to leave Africa. For example, some members of H. heidelbergensis left Africa around half a million years ago, evolving into H. neanderthalensis in Europe. Those that remained in Africa almost certainly gave rise to H. sapiens. And if the conclusions of a recent paper by Argue et al. studying the phylogeny of H. floresiensisis are correct, then another and possibly earlier human migration out of Africa occurred. This species’ forebears are closely related to H. habilis, the oldest species in our genus, Homo. It’s almost as if the need to migrate is as defining a feature of our genus as bipedalism, a large brain and an opposable thumb. AJ and I ducked out of the house on the night of August 11 to have a quick wine or two at King O’Malley’s pub in the city. When we got there we discovered the place had been invaded by Science in the Pub, and the two of us spent a pleasant hour drinking white wine, eating free food, and watching a slide show about the New Horizons mission to Pluto. What’s more, it was a presentation hosted by John Berry, the American ambassador to Australia, and featured Nobel prize winner Brian Schmidt from the ANU, science communicator and astrophysicist Alan Duffy from Swinburne University of Technology, and Glen Nagle, Education and Outreach Manager at Canberra’s Deep Space Communication Complex at Tidbinbilla. What follows are some of the amazing facts we learned about the New Horizons mission and Pluto, plus a few extra tidbits. The mission was launched on 19 January 2006, when Pluto was still classified as a planet. Eight months later it was demoted to a dwarf planet. Furthermore, in 2006 only three moons had been identified orbiting Pluto. Before the probe reached its destination, we knew of five moons. The probe’s closest approach to Pluto occurred nearly nine months after launch, on 14 July 2015, and after a journey of approximately 7.5 billion kilometres. Disappointingly, New Horizons was 7.5 seconds late for its appointment. Still, not too bad when you consider that to travel the same distance travelling at a highway speed of 100 kph, it would take you around 8,560 years. In other words, to arrive in 2015 you would have had to start driving about the same time the world’s first city walls were being built around Jericho. 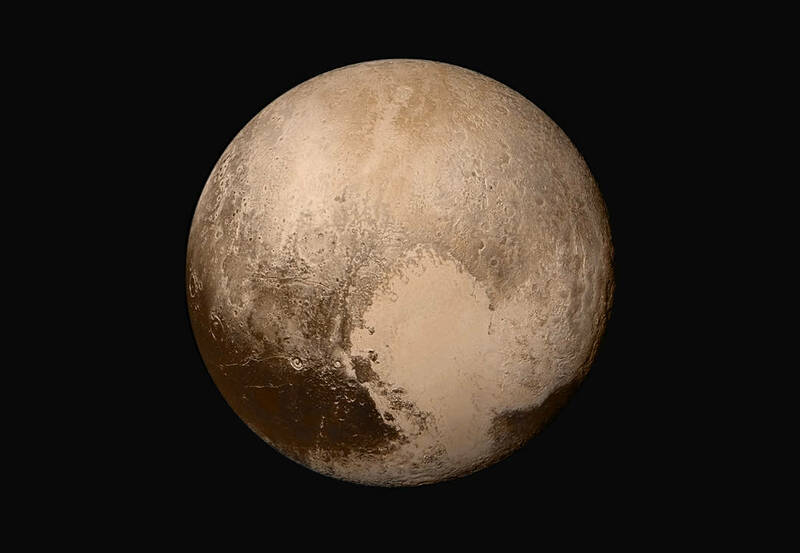 Shots of Pluto’s night side were made possible because of reflected sunlight from Pluto’s largest moon, Charon. Pluto’s atmosphere expands as its eccentric orbit brings it closer to the sun, and then freezes when Pluto recedes from the sun. Since its last closest approach to the sun in the 1990s, Pluto’s atmosphere has halved. This was confirmed by a radio signal sent from Earth to New Horizons through the atmosphere when the probe reached the other side of Pluto. The signal had to hit a piece of equipment about the size of a credit card, and enabled scientists to measure the signal’s radio occultation. Scientists were surprised to discover that ultraviolet light broke up some of the methane in Pluto’s atmosphere create more complex hydrocarbons such as ethylene and acetylene. They were even more surprised to learn that about 50% of this UV comes not from our sun, but from other stars. Pretty exciting stuff for a dwarf planet. All in all, an excellent night at the pub.